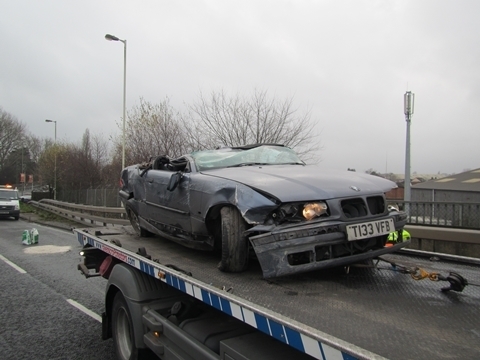 An uninsured driver, who flipped his car upside down on the opposite carriageway in Southampton, has been fined and banned. Ryan Vincent, 33, of Crawte Avenue, Holbury, was found guilty in his absence at Aldershot Magistrates Court for driving without due care and attention. He was also found guilty of driving without any insurance. The court heard how Vincent was driving a blue BMW along the A35 heading out of Southampton at 1.15pm on 27 December 2015, when he tried to undertake a Peugeot. As a result he lost control of his vehicle, hit the nearside barrier and rebounded, hitting the front of the Peugeot and then hitting the central reservation barrier. The momentum was such that it caused the BMW to lift into the air and travel onto the eastbound carriageway, hitting a Volkwagen and a Citroen, before coming to rest upside down on its roof. Everyone involved escaped any serious injuries, with Vincent suffering only from a minor injury. During the sentencing the chair magistrate described the crash as "horrifying" after he was shown dash cam footage of the crash. Vincent was banned from driving for 14 days for driving without due care and attention and received six points on his licence for driving without insurance. He was also fined £320, ordered to pay £40 court costs and a £20 victim surcharge. "This was a serious collision that closed a major route in and out of Southampton for several hours, causing huge disruption. "It could have been completely avoided if Vincent had not driven without due care and attention, trying to undertake another car. "As you can see from the dash cam footage, this was a terrifying crash for all of those involved, many of whom were just innocent road users going about their daily business when they got caught up in this nasty collision. "It was only sheer luck that nobody was left seriously injured. "We hope that by sharing this footage it will send a strong message about how one irresponsible decision can have a huge and potentially devastating impact on not only your life but the lives of other road users around you. "It is not worth the risk and we will take action to ensure justice is done."